Exceptional service, a compelling wine list, a seasonally fresh menu, and specialty cocktails (yes, they have a liquor license) have kept this beloved global restaurant open for 23 years in Ketchum. 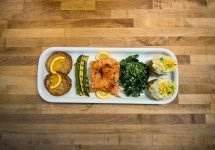 Customers return again and again to experience favorite dishes and those that the chef changes nightly, weekly, and seasonally in their new location on Washington Avenue. The modern décor, which suits the fabulous, innovative cuisine of this local favorite, gets rave reviews. According to food celebrity Rachel Ray, Globus’ Muc Chien (calamari) is “the best on the planet,” and the Hoisin-Glazed Baby Back Ribs (now served with an apple celery slaw and serrano-smoked gouda cornbread) can’t be beat. Join us this fall to see what new creations Executive Chef Tracy Bailet will be serving. Whether fresh from your adventure on the mountain or after ripping the local single-track, Limelight Hotel in Ketchum is the place for seasonal gourmet comfort food, drink and entertainment.